Gov. Chris Christie Charms, Disses Washington : It's All Politics Christie accused Washington politicians of lacking courage to tell hard truths, ignoring that some indeed have. One example he used, raising the Social Security retirement age, was actually recommended by no less than Speaker John Boehner last June when he was still minority leader. Even a journalist who normally delights in skewering politicians for their foibles, like the Washington Post's Dana Milbank, seemed won over by the XXL Republican known for his blunt-talking style. As he has before, Christie ruled out a run for the White House - not the non-denial denials of his peers, but a categorical denial. "What do I have to do short of suicide to convince people I'm not running?" he asked. "Apparently I actually have to commit suicide." 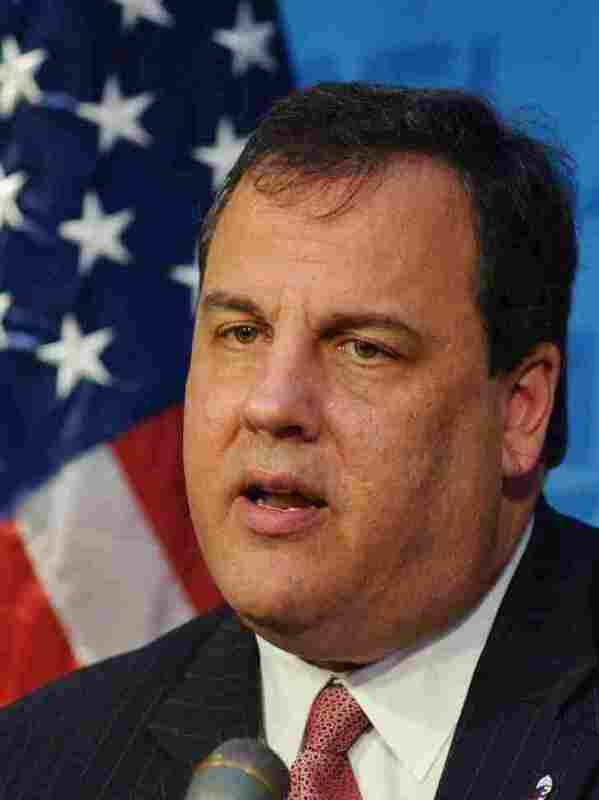 Setting aside his own presidential ambitions for now makes Christie's warning to Washington all the more potent - and the jaundiced pols of this town would do well to listen as the fat governor gives them the skinny. "You just have to have the spine to say, 'I'm going to take the risk,' " the governor coaxed. "I think that's what we elect leaders for. Hence the name." Christie definitely has a middle-class Everyman persona that makes him an attractive politician even to cynical journalists. Anyway, Christie portrayed himself as leading by example when it came to risk-taking. The dangerous political move he took Wednesday, by his lights, was to take on Social Security. Specifically he said the age to for claiming full benefits needed to be higher. You're going to have to raise the retirement age for Social Security. Whoa-ho! I just said it, and I'm still standing here. I did not vaporize into the carpeting, and I said it. We have to reform Medicare because it costs too much and it is going to bankrupt us. Once again, lightning did not come through the windows and strike me dead! Actually, Christie might want to have his staff do some Googling before his next big Washington speech. "We're all living a lot longer than anyone ever expected," Boehner said in a meeting with the editors of the Pittsburgh Tribune-Review. "And I think that raising the retirement age — going out 20 years, so you're not affecting anyone close to retirement — and eventually getting the retirement age to 70 is a step that needs to be taken." That actually got a bit of attention after Boehner said it, with Democrats pouncing, vainly hoping the comment would scare enough voters to keep House control in their hands. That Boehner made his statement at a time when he was trying to win control of the House for Republicans and the largest GOP majority possible is arguably much braver than Christie saying it. Voters knew Boehner would be in a position as speaker to do something about raising the Social Security retirement age. As a state governor, Christie isn't. And "reforming Medicare" isn't really that brave a stand for Christie to take. Virtually every politician across the ideological divide agrees Medicare needs to be reformed because its rising costs are insanely unsustainable and threaten national solvency. The question is how do you reform it? How much do you reduce benefits to beneficiaries? Do you give senior citizens vouchers to partly or fully privatize the system? It's over such details that bravery is needed because, whatever's decided, many voters are going to be unhappy. All this isn't to say that Christie isn't right to chide Washington politicians for being unwilling to be the first to walk through the electoral landmines on some of these issues. Eventually, any great endeavor in a democracy takes leadership. But knocking Washington politicians for not talking about raising the Social Security retirement age is perhaps not the best example he could have used to make his point.